April was a sad month. It was the first time Mothers Day came around without my Mum. We lost Lis Sladen, too - which put even more of a damper on the new series of Dr Who than killing the main character off in the first ten minutes had managed to do. But there were positive things afoot, too - multiple rumours about the Higgs boson, SpaceX announcing they were planning a mission to Mars, and I got to see a whole bunch of fine movies. Folk are still commenting on the Boing Boing handwriting story. While it makes for depressing reading, it hasn't taught me anything new. The same story crops up every few years; I found an almost identical thread from 2006 over at Techdirt. Six months before that, on the 14th February I'd blogged about a Guardian article on the same subject (and the month before that, I'd blogged about a decline in reasoning skills - some things never change). Time magazine ran a story about The Death of Handwriting in 2009 which trotted out exactly the same tropes. So I did what I always do in such circumstances - I went online to see what scientific studies I could find about the subject. "I don't need to be able to write neatly if I always use a keyboard," the Boing Boing commenters say. Maybe so, but that's not the point. Castro-Caldas, Petersson, Reis, Stone-Elander and Ingvar established that learning to read and write during childhood influences the functional development of the adult human brain. What's really interesting is that writing in different ways actually appears to engage different parts of the brain: Google books threw up a number of interesting references, including a tantalising reference in Writing in Focus by Florian Coulmas and Konrad Ehlich to the idea that rapid, non-figurative tasks and more accurate, symbolic activities engage two semi-independent motor systems. If that doesn't describe the difference between scribbled notes and flowing handwriting, I don't know what does. I found that intriguing enough to order a copy of the book, so when it arrives you can be sure that I'll blog about this whole issue again. On a more basic level, a study mentioned in the Journal of Educational Psychology echoed Umberto Eco, asserting that without the assistance of the cut-and-paste, drag-and-drop functionality of a computer word processing package, students have to plan what they are going to write in advance and monitor their performance more closely as they commit pen to paper. In other words, handwriting engages cognitive skills that are not deployed when we sit at the keyboard and type: students given additional instruction in writing "produced essays that were longer, contained more mature vocabulary, and were qualitatively better" than those in a control group. Although it is possible to separate one from the other (and that this has already happened is evident from the comments being made at Boing Boing), neglect in developing one skill has a deleterious effect on the acquisition of the other. It's sad to see how many people don't regard this as a problem. Apparently there's been some big function going on in London today. The television has not been on and I've avoided the radio. Instead, I've been listening to Frank Zappa albums and enjoying chilling out on a day off. I went to see Werner Herzog's Cave of Forgotten Dreams this week and I've written up a review for your edification and enlightenment. Or something. Contentiousness is a powerful driver of web hits, obviously. Since I posted the link to that image, it's been viewed over 70 times on Flickr. I get the distinct impression that I'm in the minority as far as comments in the Boing Boing thread go; the majority of remarks can be crystallised down to "I don't write neatly, good riddance to it." If I was in a snarky mood I'd point out how many of the comments denigrating the idea of developing a personal style of neat handwriting also contain spelling mistakes, and how those posts supporting cursive tend to be more coherent and well-structured. That's bound to be just a coincidence, right? However, I'm not going to give up on Boing Boing just yet. Any website prepared to devote space to a photograph of Karl Lagerfeld in a hotel suite made out of chocolate earns itself an extraordinary amount of leeway in my opinion. Carry on! It's International They Might Be Giants Awareness Day! Four tracks from the new album are released on iTunes today, and I'm going to see them at the Latitude Festival in July! I'm a big fan!! How many exclamation points do I have to use before my excitement is adequately conveyed?!!?! Elon Musk's SpaceX have a new goal: to put a man on Mars by 2020. And when they talk about "a man" I'm betting they mean Elon Musk himself, who told The Guardian last year he was planning on retiring there. Wow. OFF AND RUNNING, OR STUMBLING? The new series of Doctor Who kicked off yesterday, and did so with one of the most shocking moments I think I've ever seen on the show since it started. I'm not going to say what happened in case you haven't seen the episode yet, but I've now watched it twice, I've been thinking about it for twenty four hours, and I still can't decide if it's the most inspired bit of writing ever or the most damaging thing anyone has ever done to the show. Yes, it's one or the other, but I don't know which. I don't know, and I'm worried. Until the plot development - and that's all I'll refer to it as - is eventually resolved I don't have enough to go on to make a judgment. I'm concerned, though. On Dr Who Confidential last night, Steven Moffat was explicit: the plot development is exactly what it appears to be, and the results are exactly what the characters are told during the episode. The message is clear. And that's what worries me. Because, even if we know that at some point in the Doctor's future the plot development is going to take place, we shouldn't be shown it. Because however dramatic it may be, it imposes huge constraints on the future of the show. Even five minutes' thought will bring up one glaringly obvious one, which for the sake of spoiler avoidance I'm just going to describe as a future casting issue. But more than that, the plot development means the show has to deal with issues that, while inescapable, aren't particularly germane to a show that is aimed so strongly at children. I'd be interested to know what folks with younger children thought about letting their kids watch last night's episode. There is a basic assumption with the audience that they'll see stuff that is scary, yes, and that might give more sensitive children nightmares. But I found the plot development profoundly upsetting, and I'm sure small children did too. I think it's a misjudgement of the core audience, and I think that unless the plot development is resolved in a reassuring and positive way, it could end up destroying the show by trying to turn it into something that it's not and should never be; can you imagine the outcry if someone took Scooby Doo and tried turning it into Buffy, for instance? Oh wait, they did that, didn't they? And it stank, didn't it? If it was anyone else writing the episode, I'd throw my hands up in disgust, mutter something along the lines of "they haven't thought the implications through" and throw away much of the emotional investment I've had in the show for much of the last forty-odd years. If it was anyone else in charge of the show, the plot development would probably end up with me returning to the "take it or leave it" approach I had to the show in the McCoy years, when I started occasionally missing entire episodes and ended up doing other things on Saturdays altogether. But with Steven Moffat in charge, I'm not ready to do that yet. Because I'm expecting him to pull something even more extraordinary out of the bag to provide a resolution. There are enough little clues in the first episode to make me think it's possible: River's line of "No, of course not" after she empties her revolver; a couple of shots of the Doctor looking pensive for no apparent reason; an exchange of dialogue between him and someone else that we don't get to hear beyond "It's OK, I know it's you." I've already got a theory about who "you" is, too - although if I'm right, it could easily be a huge cop-out. Things are pointing to the show taking a direction that, frankly, I don't think is going to work. I hope I'm surprised. I'm worried I won't be. I know Moffat is one of the best writers on TV and I believe he's capable of taking my expectations and transcending them. I just really, really hope my faith in him is justified. I had to stop and get out of the car on the way in to work yesterday. The reason? As I drove down the access road to the office, there was a mallard drake standing on one leg in the middle of the road. He obviously had no intention of moving, either. A guy in a silver Toyota Celica was leaving one of the other offices as I got out of the Z, and he was laughing his head off at the whole spectacle of me chasing a duck down the road. I guess it was pretty funny. The rest of yesterday went OK, and the hack to and from Oxfordshire passed without incident. I saw a couple of red kites, too. Although the traffic on the M4 was bad in the afternoon, I was home before 6, and was delighted to see that the roundabout construction at the top of the hill has been suspended for the holidays. Result! It's Good Friday, and I've spent a quiet day by myself. By noon I'd done some laundry, mowed the lawn, and extricated the barbecue from the garage. It clouded over this afternoon but it's stayed dry. I cooked a couple of burgers on the grill and they tasted great! After the chores were done I spent the afternoon chilling out, but I've stayed off the Playstation - it sounds like Sony have been having problems over the last couple of days and anyway, I have plenty of reading to catch up on. For a start, I'm making my way through Ben Watson's epic essay on Frank Zappa, the Negative Dialectics of Poodle Play. Aside from the occasional ad hominem and strawman arguments, it's a fascinating look at Frank's career. It's already prompted me to fill in a few of the gaps in my Zappa collection, particularly the early albums. I first got in to Zappa around 1980, though the first album of his that I really obsessed about was Ship arriving too late to save a drowning witch which came out in 1982 and features a very young Steve Vai playing what Zappa's liner notes refer to as "impossible guitar." The TV's on right now, though. The BBC HD channel is showing Raiders of the Lost Ark and it looks very, very good in high definition. So I think I might bring the blogging to a close, uncork a bottle of wine and enjoy the rest of the movie. Whatever you're doing, have a good evening! I was so sad to hear that Elisabeth Sladen died yesterday. It was during her tenure on Doctor Who that I really got what the show was about, and went from being a regular watcher to an enthusiastic fan. For all the Doctor's idiosyncrasies and abilities, he remains an alien. It's the role of the companion to inject some humanity into the proceedings and nobody on the show has ever done it better than Sarah Jane Smith. The interplay between her and Jon Pertwee (and then, best of all, with Tom Baker) was riveting, unmissable stuff. The fourth Doctor wasn't just the best Doctor because he was Tom Baker; he was the best Doctor because of his relationship with Sarah Jane. On Twitter last night, the top three trending topics were all to do with her passing, and Mitch Benn commented that the last time he'd seen an outpouring of emotion on anything like this scale was when Michael Jackson died. I have to say that, frankly, I think Ms Sladen had a far greater effect on my life than the Gloved One. I was delighted when her character reappeared on Dr Who, complete with K-9 during David Tennant's stint - and her spinoff series The Sarah Jane Adventures was one of the best things on children's telly in many years. Most of all, though, the reactions of people to her death have all focused on what a lovely person she was. Wherever she is, I hope she knows how much we are all going to miss her. I've got the patio door open and there is a wren singing extraordinarily loudly somewhere close by in the garden. There are two collared doves sitting on the bird table, hoovering up the seed that falls from the sparrows attacking the bird feeder above them. It's another lovely day here in the south west, the sun is shining brightly, and I don't feel too bad at all. Britain is basking in a spell of gloriously warm weather and it feels good - as if winter is finally losing its grip on my mood. 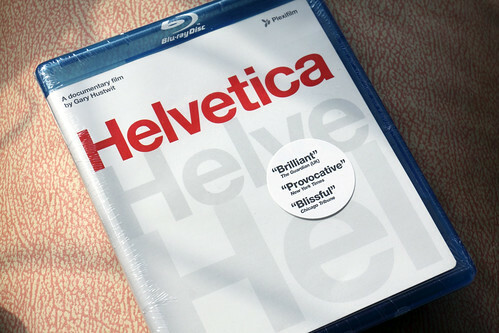 I really enjoyed the Helvetica film. I found it fascinating, although if I'm honest I'd have liked it even more if they'd put in a bit more technical information. There were plenty of shots of computer screens and drawings of letters that passed without explanation. On the other hand, I'm a bit of an anorak about such things and I suspect that if the director had decided to explain such things, it might come across as being a trifle pedantic. An extra on the fundamental characteristics and construction of type would have been nice, though. It was lovely to see the very sprightly Hermann Zapf talking about his work, and Neville Brody was fascinating. But the person who made the biggest impression on me was Professor Erik Spiekermann, whose devotion to type is wonderfully apparent in the extras: "I will not read anything unless I've identified the typeface." I found myself nodding in agreement with just about everything he said - sadly, even down to problems with failing eyesight. Elsewhere, the film also echoes a problem that I have with a lot of modern design: the abandonment of the rules and systems developed over centuries means that "designers who used to be incompetent can now fit right in." I couldn't have put it better myself. I've managed to do a little writing over the last 48 hours or so and I've got the basic shape of a couple of short stories thrashed out. The trouble is I really don't feel like sitting down and completing them. Although I'm off the antidepressants (and have been since before Christmas) I still have bleak spells and the last week or so has been difficult. Although I feel a little better today, I'm still under the weather. I spent a couple of hours this afternoon tidying up, which normally improves my mood, but I still feel distracted and listless. The pot of tea and a couple of hot cross buns I had just now have yet to perk me up so it's time to step away from the keyboard for a while and go read a book, I think. The stories can wait. I've bowed to the inevitable and created the Headfirstonly YouTube channel. There's only a handful of things on there at the moment, as my rural broadband connection means it takes ages to upload anything, but I'll add more stuff as time goes by. So far everything I've posted was recorded with my Canon PowerShot rather than my camcorder - the days of MiniDV tapes and firewire cables seem very far away now that I can plug a card into my computer's reader and import stuff in seconds. I might have a spin through some old stuff over the holidays and see if there's anything amusing or interesting enough to warrant sharing. William Shatner has announced the track and artist listing for his upcoming album, and it reads like a who's who of prog rock. Michael Schenker, Steve Howe, Ian Paice, Johnny Winter, Ritchie Blackmore (Ritchie Blackmore! ), John Wetton and Edgar Froese are just some of the names that had my jaw dropping to the floor. I really can't wait to hear the results. Making a movie about a font might seem a little unusual, but Gary Hustwit's documentary has been garnering enthusiastic reviews since it came out in 2007 and the list of people who appear in the movie reads like a history of type design from the last hundred years. Time to fire up the TV! Urgh. It's Monday again. Monday always comes as a nasty shock, but particularly when I've had a very good weekend. The weather has been spectacularly good over the last few days and I've taken the opportunity to get the lawn cut, tidy up the garden, and go out for a walk with the camera. After an early supper at the pub last night I even managed to get a good night's sleep. It's just a pity that as far as Mondays are concerned, sleep never lasts long enough. By half past two this afternoon I was yawning my head off. Despite the good weather I spent a couple of hours on Saturday afternoon sitting in a room with no windows. I was at the Wotton Electric Picture House to see Gore Verbinski's Rango. I knew next to nothing about the film - I'd not seen any clips, I'd avoided all of the trailers apart from the initial teaser that featured a clockwork fish slowly making its way across the screen, and the only thing I would have been able to tell you about it was that the studio wanted to convert it retrospectively to 3D, but Verbinski wouldn't let them. I'm glad I went in knowing next to nothing, as it made just about every scene a delight. It's the first animated film from Industrial Light and Magic, and on this showing Pixar had better start raising their game. It's as if the folks at ILM said "Okay Pixar, you think you can do convincing water? You think that looks like fire? You think your particle systems are man enough for this?" There's lots of interest on the web at the moment over a paper submitted by a team studying particle physics with Fermilab's Tevatron collider in Batavia, Illinois (just west of Chicago.) The Tevatron works on the same principle as the Large Hadron Collider - you accelerate atomic particles up to huge speeds using two rings of magnets several kilometres across, so that the particles in one ring travel in the opposite direction to the particles in the other ring; when your particles are going as fast as you can make them, you make the two rings intersect. With luck, some of your particles will collide and get smashed into smaller bits, and a set of detectors around the intersection point will pick up the debris left over so you can figure out really interesting stuff - like what atoms are made of or what the fundamental forces of the Universe are. "We find a statistically significant disagreement with current theoretical predictions." That's one of the most exciting sentences you're likely to read in any research paper, but when the paper is about particle physics, things get really interesting. Physicists have something called the Standard Model (SM) to describe the structure of matter and how some of the fundamental forces of the universe (the electroweak and strong forces, but not gravity) interact with it. Up until now, the SM has been pretty good at predicting what will happen when you smack stuff together in colliders like the Tevatron. The results obtained by the Fermilab team seem to indicate something new, however. For a few hundred collisions of the many thousands they observed, there is a noticeable bump which suggests that they're seeing a particle with a mass of around 144 GeV/c^2 being produced and then almost immediately decaying. A proton is about 1GeV/c^2, so whatever the Tevatron's mystery particle is, it's about 150 times as heavy as a proton. The SM has no answer for what it might be; the folks at the Tevatron don't know what process was forming that particle, or what that particle was. It's unlikely to be the elusive Higgs boson, but that only makes things more interesting. There's talk that a new fundamental force may be at work, and if that's the case then at the very least the Fermilab paper is likely to be as important a development in physics as Salam, Glashow and Weinberg's Nobel prize winning work in the 1970s unifying the electromagnetic and weak forces. I'll be watching this one with interest. WHICH END TIMES IN PARTICULAR, SONNY? There are still people out there who think that the LHC is going to bring about the end of the world. If you don't know enough about basic physics to understand what goes on there, I suppose it might seem a bit scary. Belief in the end-times used to be quaint, but when American politicians are reported as saying that they don't believe it's necessary to do anything about climate change or other environmental disasters because Jesus will soon return to take them off to heaven, I get angry. The thing is, people have always believed that the world was about to end. Loren Madsen's pick a year gathers together an intimidating (and somewhat depressing) collection of those nutjob predictions in one handy reference guide. It's well worth a read. I love watching for meteors. I can still remember watching a fantastic meteor swarm with my mother back in November 1998 during the Leonid shower when several fireballs (meteors that appear brighter than the planet Venus) were arriving every minute. Some of them were bright enough to cast shadows. That was something truly special, a once-in-a-lifetime event. The Leonid shower is just one of several meteor showers that occur every year, and it's now known that these showers happen when the Earth's orbit takes it through the trail of debris left behind by a comet. In the case of the Leonids, the comet in question is 55P/Tempel-Tuttle. But you don't need to wait for one of the big showers to see shooting stars. If you go outside after dark on a clear night at any time of year, you stand a chance of seeing sporadic meteors - meteors that aren't associated with a particular meteor shower like the Leonids. Sporadic meteors should arrive more or less at random, but for the past 30 years or so, astronomers have known that they don't. Statistically, on any given night during the year (given a site with a dark sky and no clouds, of course) you can expect to see ten or so fireballs between dusk and dawn. What's quite interesting is that in the spring, the rate of these fireballs is 10% higher than at other times of year and as NASA's science news report explains, this is a little bit strange. In explaining why it's not what astronomers expected, the article introduces a term I'd not come across before: "The apex of Earth's way." It's the spot in the sky that Earth is moving towards as it travels along its orbit round the Sun. As NASA explain, you'd expect most sporadic meteors to come from that general direction just as you'd expect most insects to hit the windscreen of your car as you travel along a road. And for most sporadic meteors, this turns out to be the case. However, the really interesting point is that the exceptionally bright meteors seen every spring come from the opposite direction. Going back to the windscreen analogy, it's like going on a long car trip and finding when you arrive that all the really big bugs you hit were splatted against the rear window of your car. As yet, nobody knows why this happens. Fascinating! If you've ever had piano lessons, you'll probably remember being told how important practice is. You might have been like me, and never really took that fact to heart, considering it a chore when there were much more interesting things to be done somewhere else. I've got back into playing keyboards recently, and I really regret not being more committed to learning when I was younger. If only I could go back in time and show my younger self the extraordinary Hiromi Uehara. If I'd known what mastery of the instrument enabled you to do, and seen and heard exactly what being jaw-droppingly good at playing was like, I suspect I might have been a little more serious about my lessons and practice. Watching her rendition of I've Got Rhythm gives me goosebumps. Here in the UK, it's Mothers Day. This year for the first time I won't be phoning my Mum up for a chat; it's been just over six months since she died, and I still miss her terribly. I was surprised how upset I've been over this past week, thanks mainly to adverts and emails advising me not to forget to get her a present. As a result, I've found myself cursing advertising executives as cynical, manipulative but thoughtless dead-hearted bastards. So, no change there, then. I was given this copy of True Adventure Stories on Land when I was a small child. As it has my home address in Stafford written inside the front cover and the publishing date is 1968, I'd guess I would have been around eight years old. It was - and still is - one of my favourite books, which is why it's still in my collection. It's an odd work, though. There's a credit on the frontispiece to the editor, Peter Grey, but there is no information at all about who wrote the short stories the book contains, which is a shame, because they're all gripping. The subject matter is tailor-made to appeal to young boys and the tales range from the original "hellfighter" himself, Myron Kinley through Harry H Dunn's adventures with Zapata, Heinrich Schleimann's discovery of the lost city of Troy and a Mexican landowner called José Graham battling against a horde of locusts, to the exploits of the "modern day Robin Hood", Salvatore Giuliano. 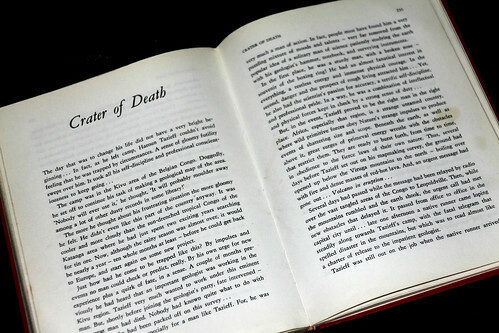 But it's the penultimate story in the book, "Crater of Death", that held the most fascination for me. Let's face it, a title like that is going to grab your attention when you're eight years old. The story concerns Tazieff's adventures as he travelled to the Congo to investigate and film a new volcanic eruption, and describes his realisation that he would spend the rest of his career not as an everyday geologist, but as a volcanologist. And that's exactly what he did: pushing the field just about as close to the edge as he possibly could, often walking up to the rim of an erupting volcano to make recordings and take samples. It's rip-roaring stuff, and it made a huge impression on me. Tazieff had a long and eventful career and although he died in 1998, seeing his name in an article can still take me back to my boyhood and inspire a sense of adventure and excitement. If you're interested in volcanoes, I'd recomment getting hold of Dr Iain Stewart's series Earth: The Power of the Planet. The episode on volcanoes includes a visit to another shield volcano in Africa, this time the extraordinary Erta Ale in Ethiopia. It's very similar to the Nyiragongo crater and the timelapse footage of lava as it migrates from one side of the lake to the other is one of the most amazing things I've ever seen on television. I was so impressed that I went out and bought the series on Blu-ray. Dr Stewart is one of the best science presenters on TV, too; his calm and thoughtful BBC Horizon piece on the recent earthquake in Japan was one of the best documentaries I've seen on TV for a very long time.